Need a quick summary of an article? Your Mac can do that, without the need for extra software – and you’ll find all sorts of OS X features you’ve been overlooking in the process. Summary Service isn’t new to OS X. It’s been around since the early days of OS X, but it’s buried in a menu you probably never look at – the services menu, one of many contextual menus on your Mac Go Beyond Keyboard Shortcuts by Using Contextual Menus On Your Mac Go Beyond Keyboard Shortcuts by Using Contextual Menus On Your Mac Using assigned keyboard shortcuts is all well and good, but advanced Mac users know about the power of contextual menus when getting things done in OS X. Read More . Yeah, that thing. If you’re like most Mac users you almost always mouse past this, which is a shame. 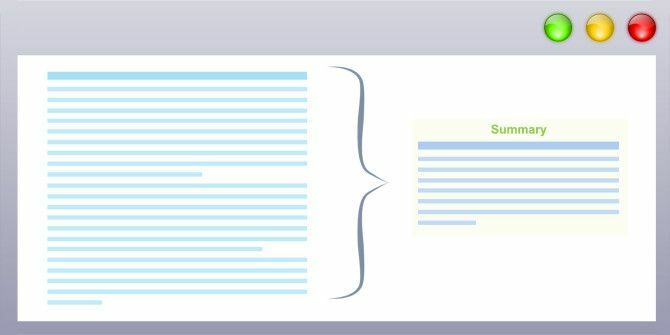 You’re missing out on the ability to summarize any text – and a lot more. You can calibrate, on percentage scale, how much of the text you want to see. The service tries to use context to figure out which sentences – or paragraphs, depending on what you set – are most essential to read in a given text. What works best will vary from person to person, but I find this to be most useful around 20 per cent. The service isn’t perfect at figuring out what information is most important in any given piece of text, but it can be a great place to start if you’re pressed for time. You can read the summarized text right here, if you want, or you can save it for later. So, what could you actually use this for? The first answer – condensing long documents that you need to read – is possible. This could be useful for research, but you may not want to rely on it entirely. But perhaps even more useful is using this tool on your own writing. Run your text through this tool and read what comes out. If you disagree that the essence of your point is coming across in the summary, perhaps you’ve not emphasized that point enough. Read your writing again, and try to make the point clearer. Click Services Preferences, as shown above, and you will see a checklist of all services. Scroll down until you find Summary Service. You can add a keyboard shortcut. This will make using Summary Service a lot easier – just highlight some text and press your keyboard shortcut to launch the service. Now you can open the service whenever you want, from your dock. What Other Useful Services Are There? You’ll also find a variety of application-specific services. If you’re an Evernote user, for example, you’ll find the ability to add any text you’ve copied to a new note. If you’ve installed Twitter for Mac, you can tweet any excerpt you copy (though, considering the 140 character limit, you might want to summarize the content first). Are you a regular user of the Services menu? Are you just finding out about Services? Let’s learn together: let me know if you find anything else that’s useful. Wondering what else might be hidden in OS X? You should check out the secret features of OS X Mavericks Secrets of OS X Mavericks: What You Really Need To Know Secrets of OS X Mavericks: What You Really Need To Know You probably already know about the major features of the latest, free upgrade for Mac OS X. Here are the hidden ones. Read More , because you probably missed something. Despite following these instructions the summarise tool does not work on my macbook. System preferences - Keyboard - Shortcuts - Text - Summarise, I even gave it a shortcut! But the tool does't work sadly, When I click on windows services it says there are no "services to apply." Help? Sounds fairly useful - thanks! MSWord 2010 no longer has the Autosummarize tool. I find Services one of the best utility parts of OS X. My most often used one is "New TexEdit Window Containing Selection", a great time saver. That does sound pretty freaking useful. Jessica is working on a roundup of services right now, so stay tuned for that article. For now I'll see if anyone on staff knows of anything. IN WINDOWS - > MS WORD - TOOLS - AUTOSUMMARIZE. Oh yeah, that's a good one! Thanks Wind. It’s been around since the early days of OS X, but it’s buried in a menu you probably never look at – the services menu, one of many contextual menus on your Mac. ...The service isn’t perfect at figuring out what information is most important in any given piece of text, but it can be a great place to start if you’re pressed for time.